Dr. Matthew DeCesare, the lab manager in the Medina lab, explained the process of analyzing stalagmites. It involves drilling tiny holes at every millimeter of the stalagmite for samples, which are then put in vials. Dr. DeCesare then reacts the samples with a small amount of acid, turning them into CO2 gas, which is injected into a mass spectrometer to collect isotopic data. The isotopic ratios of the sample allow reconstruction of what the climate was like during the time period when the stalagmite was growing. The stalagmites Medina and DeCesare collect are from Mexico, Cuba, Belize and Alabama. All of the data from these four regions is integrated in order to produce a glance at the overall picture of Caribbean climate. Dr. Medina says that knowing about past climates can help predict the future of climate change. He wants to know for how long and to what extent the climate will change in the future, once the emission of greenhouse gases is stopped. His goal is to challenge prevailing ideas on climate change, and the valuable information he has on past climates will allow for more accurate models of the future. Dr. Medina also uses his data from stalagmites to discover to what extent the hydrological cycle, which is precipitation and evaporation, will become extreme in the future. By looking at how the hydrological cycle behaved under natural conditions in the past, it will allow for a more complete picture of the impact humans have on the intensity of rainfall, aridity of areas and frequency of tropical cyclones. Not only is Dr. Martin Medina’s research impactful globally, but he has some truly remarkable findings as well. There are hidden messages in each stalagmite, like charcoal being evidence of humans building fires in caves, or pieces of pottery that show the art from a past era. One student in Dr. Medina’s lab found the remarkable stalagmite, appropriately named, “War Eagle” in Alabama, which dates back 12,000 years. Another student is presenting a stalagmite that dates back 100,000 years in an upcoming conference. 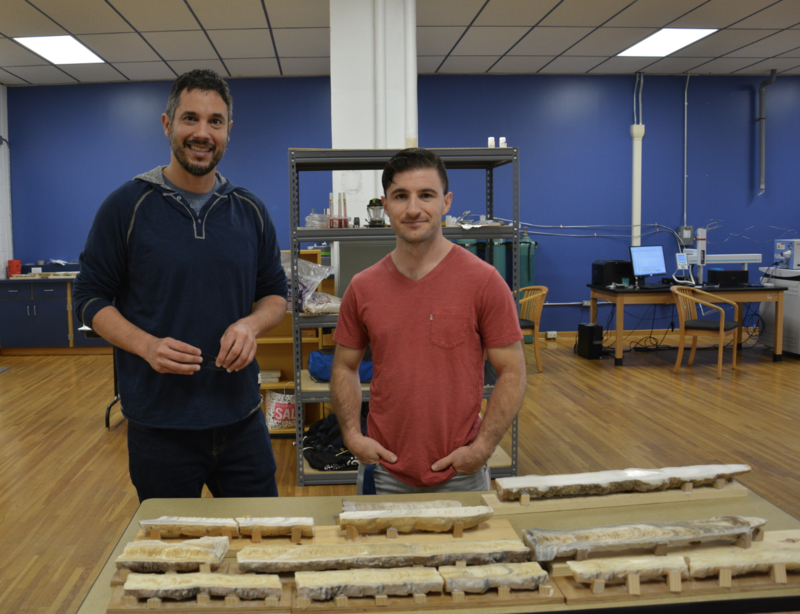 Dr. Martin Medina and Dr. Matthew DeCesare holding stalagmites with thousands of years worth of climate data inside. 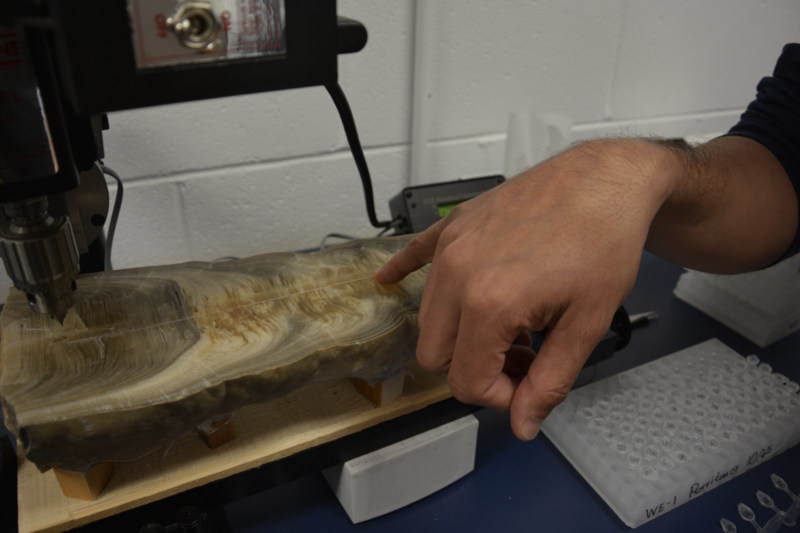 Discovered by a student working in the Medina lab, the stalagmite "War Eagle" dates back 12,000 years. 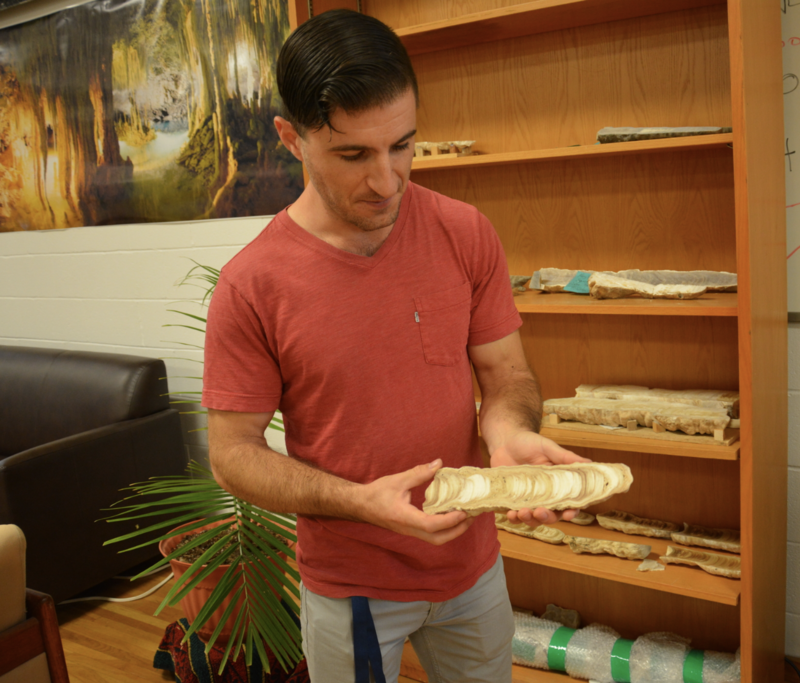 Dr. Matthew DeCesare, lab manager, holding one of many stalagmites collected. 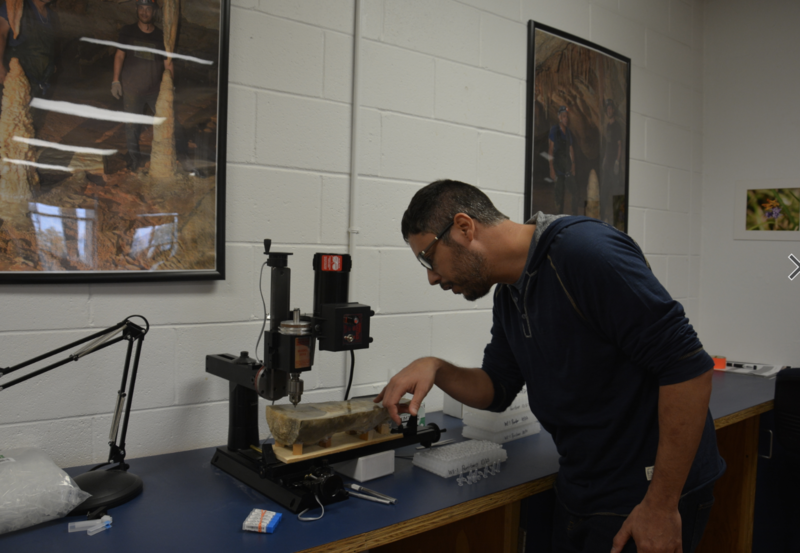 Dr. Martin Medina drilling the stalagmite "War Eagle" for samples. 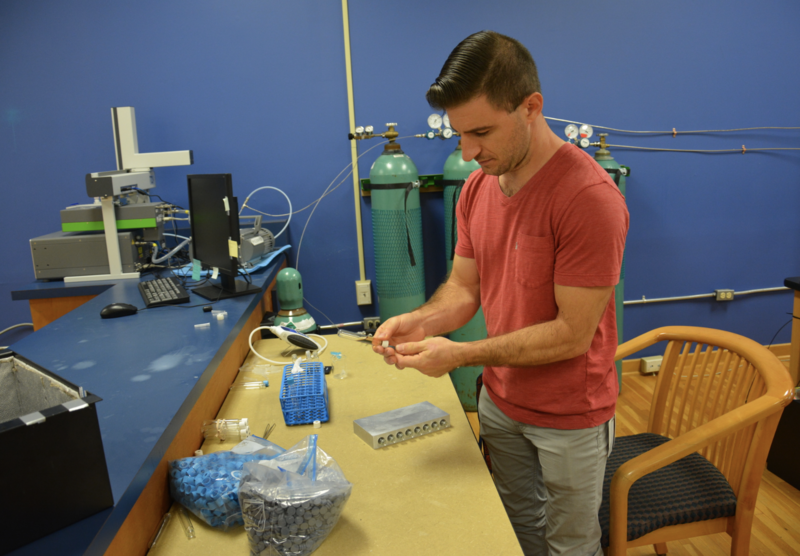 Dr. DeCesare acidifying samples for data collection in the mass spectrometer. 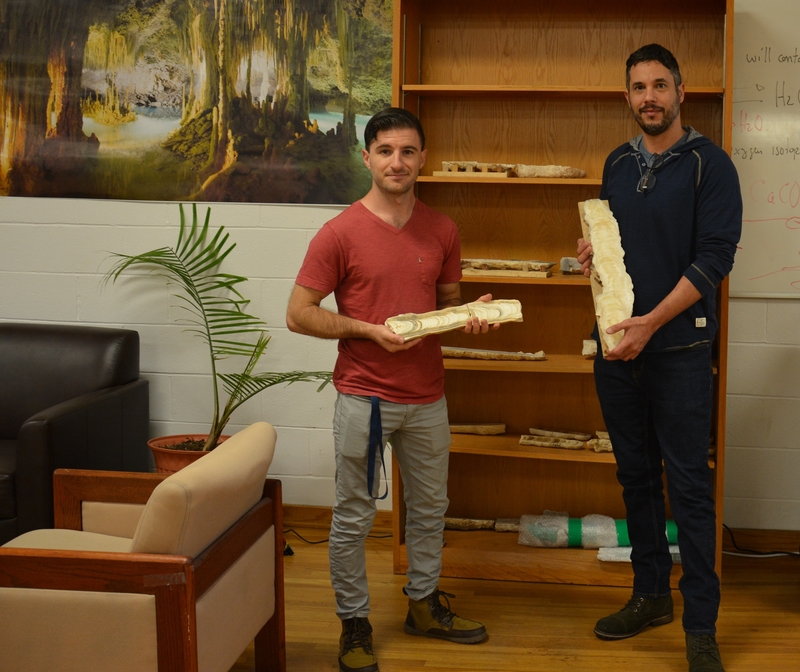 Dr. Medina and Dr. DeCesare with a few of their impressive stalagmites.